With influences from around the world, this home finds the perfect balance of contemporary and rustic. Tina and Jerry Mayes’ home feels more curated than designed, with each extraordinary element having been carefully selected by them. The owners, both doctors of dentistry, brought influences from their travels throughout the United States and abroad to the project. The result is a house that manages to blend a multitude of elements into a unified design statement. The exterior, with its combination of stone and shake, ornate metal gates, and portico brings to mind the villas of the Tuscan countryside, one of the Mayes’ favorite places to visit. Flickering copper Bevolo gas lanterns, identical to those that have been lighting the French Quarter since 1945, illuminate the way to the front entrance. The two discovered the Bevolo company while on a trip to New Orleans to visit their daughter, who was attending Tulane, and knew they wanted to incorporate the lanterns into their outdoor design. A set of steel doors with filigreed windows, that open to allow fresh air, sets the tone for the eclectic interior. “We even mixed some gothic in with the light fixtures,” Jerry points out. The iron, three-pronged sconces, to which he is referring, evoke the feel of the German castles they’ve toured and are one of Tina’s favorite features. The great room exemplifies modern and rugged working in harmony. 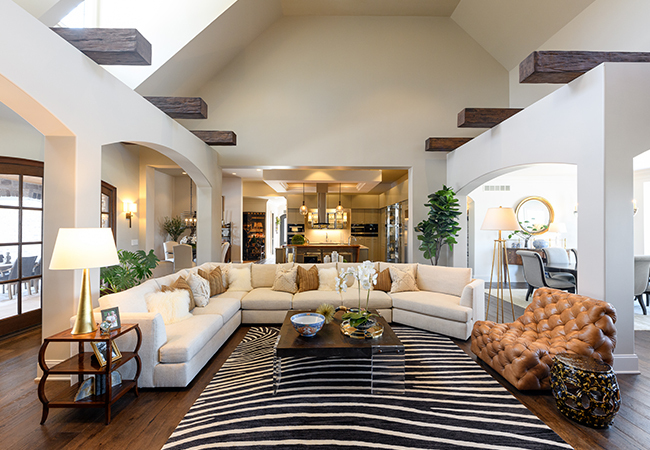 Standout architectural features are the Southwest-style bullnose arches, sturdy decorative beams, and engineered wood flooring. 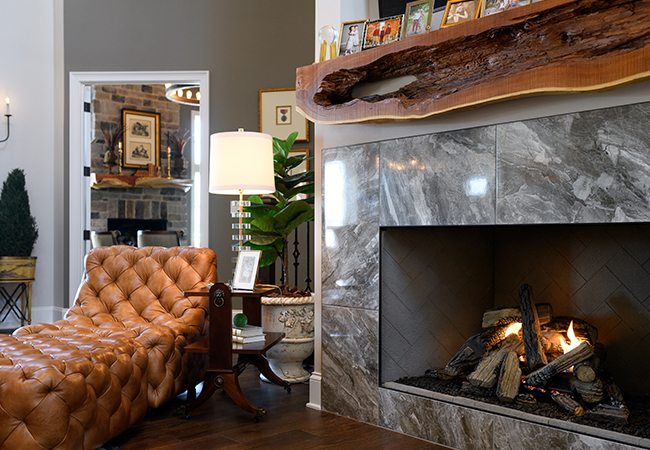 The room is anchored with a stone, gas-log fireplace from Barnhill Chimney Company with a live-edge, cedar mantel from renowned wood sculptor, “Captain Dave” Lavoie of Little River Artistry in Townsend, Tennessee. Lavoie designed three other mantles for the home, as well as the unique sink base for the main floor powder room. The majority of the home’s furnishings, lighting fixtures, and window treatments were procured from Ryser’s Furniture, near London, Kentucky. Prior to moving to Lexington two years ago, the duo also resided in London and still both manage and see patients at the London Dental Center of Excellence. 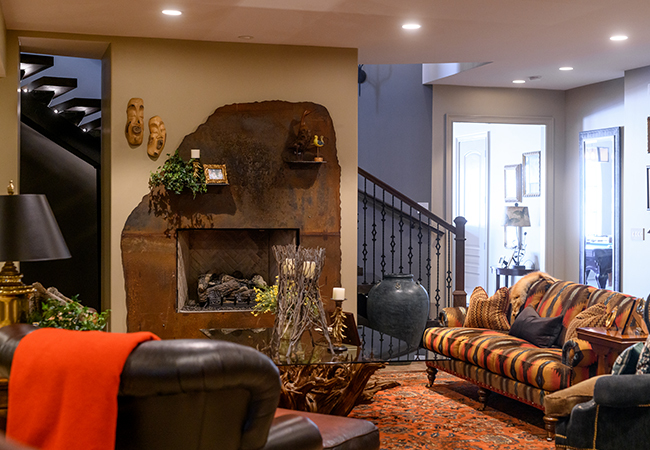 Kim Ryser-House, longtime friend and the store’s owner, provided a variety of options from the showroom’s vast array of unique products, and then Tina and Jerry honed them down to meet their tastes and needs. They chose a mix of materials and fabrics, including metal, leather, cowhide, glass, and wood. However, to create an easy flow from one area into the next, they stuck with a neutral palette of ecru, warm beiges, and cool greys. This extends to the walls and window treatments, as well. Past the great room is a spacious outdoor entertaining area with a woodburning fireplace, big screen television, outdoor kitchen, and plenty of seating for nature watching—a family of deer occupies the property. Stone arches and beams unify the porch/patio with the indoors. In the open kitchen, the couple wanted to capture the sleek, streamlined feel of Miami Beach. To accomplish this, they installed stainless steel appliances and glossy custom cabinetry. 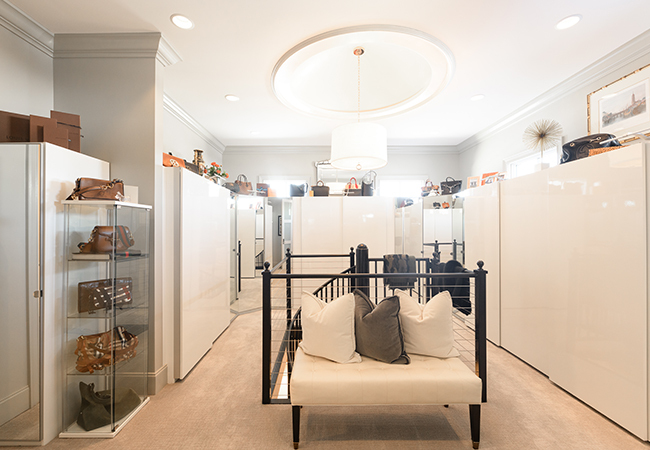 Jerry, along with Ronald Butler from Boone Forest Products, designed and installed the European-style cabinets, which reach from floor to ceiling to maximize storage. 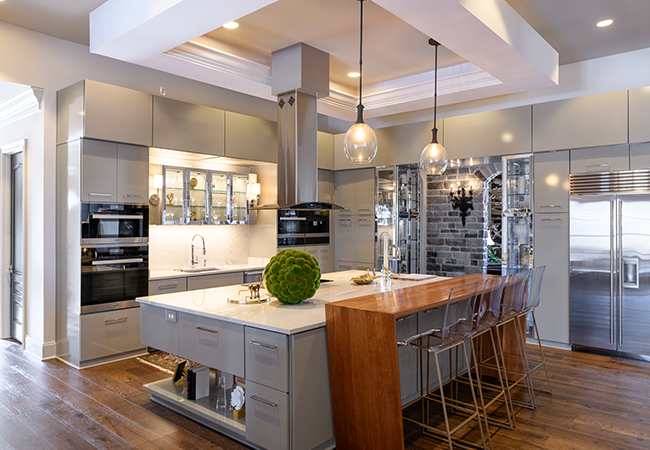 Chrome and glass display cabinets add opulence, while Miele appliances add the latest in cooking technology. It was on a visit to Atlanta that the Mayes’ discovered the Miele brand at the retail destination, PIRCH, and were immediately sold on the revolutionary line. Their kitchen contains Miele’s high-tech coffee station, induction range, microwave/fast oven, and both a large and small combi-steam oven. The central kitchen island is topped by marble, which was purchased as a single slab and then fabricated by Ronnie Elkins of Laurel River Stoneworks. An exquisite, modern high table by Mike Angel of Red Dog & Company of London provides in-kitchen dining. For additional dining space, the home also boasts an attached breakfast room and formal dining room. 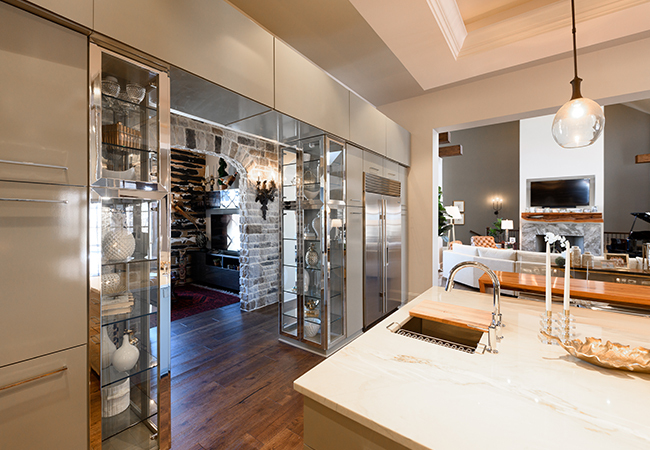 And, an off-kitchen butler’s pantry offers additional storage and prep space when entertaining. Adjacent to the great room is the family’s informal den, which was originally destined to be a wine cellar. An arched brick ceiling adds a Tuscan touch, while a wall of reclaimed farm fencing from Longwood Antique Woods gives a nod to the Bluegrass. To accommodate family and friends, three guest bedrooms and two full baths are located at one end of the first floor. Tina and Jerry’s favorite place to relax, the master suite with master bath, is positioned on the opposite end to afford privacy. The suite is large but cozy with an asymmetric fireplace/entertainment unit and expansive windows with simple treatments to maximize the view of the wooded acreage behind the property. 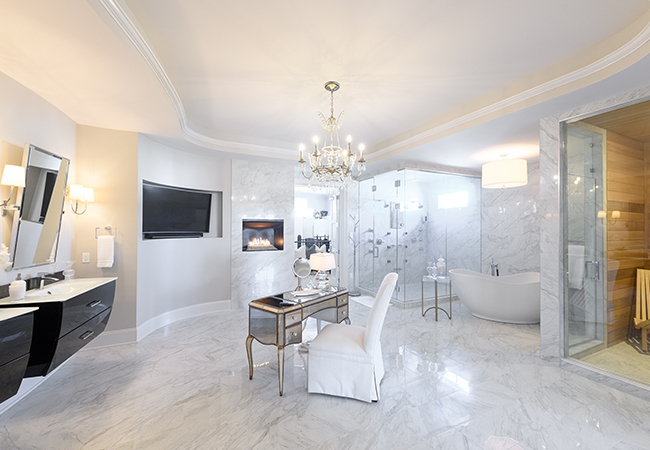 The master bath renders every luxury with a heated marble floor; inset fireplace and television; Kohler freestanding tub and state-of-the-art shower from Plumbers Supply; his and hers piano-black, floating vanities; and a wet/dry sauna inspired by their travels to the Baltics. “I think there are two saunas for every person there,” Jerry says, with a laugh. Each has their own fully customized walk-in closet. In Tina’s, she can fully indulge her love of organization. Wall-to-wall cabinets encase multiple wardrobes; rods and clear drawers for accessories; and pull-out shoe shelves, while leaving ample space on top for her to keep her collection of handbags within easy view. Just off the closet is the couple’s laundry room. Throughout the suite, doors are adorned with crystal knobs from Willis Klein Showrooms. A spiral staircase, crafted by Jeff Williams of Williams Ornamental Work, leads down to a second closet which supplies seasonal storage and a home gym. In addition, the walkout basement includes a billiard room, guest bedroom, full bath, and second great room with plenty of seating for both socializing and dining, a kitchen, and a raised stage equipped with multiple musical instruments so the grandchildren can perform impromptu concerts. This room celebrates the pair’s love of the Sedona-Phoenix area. The Southwest influence is evident in dark leather furnishings, Native American art, and rugs and woven accessories in desert shades with traditional patterns. The unique fireplace surround, also by Williams, was created from a piece of salvaged sheet metal. Some of the room’s most interesting objects include a glass top table with a reclaimed root base from Little River Artistry; hand-carved masks from one of their excursions to Alaska; and a pair wool blankets from the Gold Rush era with stripes declaring the number of beaver pelts each required for purchase. Undoubtedly, future finds from their travels, along with items to entertain their grandchildren, will find there way into the Mayes’ home. And, each will be incorporated seamlessly to further enhance the already distinctive design.